Last week I started my investigation on the Oracle BEA acquisition. It's still developing, since I have some questions. But I do have some thoughts. 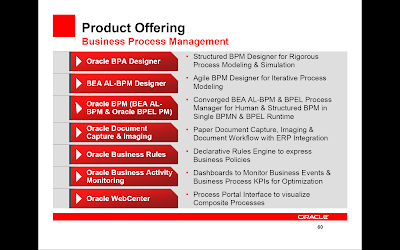 One of the things I wrote about are my questions around the BPA and BPM suites and also about the Process Engines, since I fugured that for the process engine Oracle would choose BPEL as it would choose BEA's aqualogic for the ESB, as would be suggested in page 56 from Thomas Kurian's presentation: Here you see that only the Oracle BPEL Process Manager is shown. 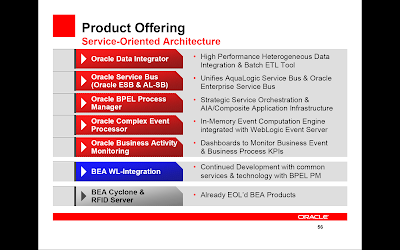 This page does not name the process engine of BEA and would suggest that Oracle BPEL PM is considered to be the main engine. But thinking and discussing it through I think I must conclude that Oracle is going to do it the Toyota Prius way: having two engines in the same car. So the converged Process Manager as I read it now will contain the BPMN engine from BEA and the BPEL PM engine from Oracle (Collaxa). And this enables you to tank your fuel from both Shell as well as Essent/Nuon. The advantage of this is that the BPA Suite could still generate BPEL Blueprints and work the way it works now, fuelling the BPEL engine through the jDeveloper BPEL Designer. And the BPM suite can fuel the former BEA-AL BPMN-engine. This keeps me wondering about the Enterprise Service bus. Many do expect Oracle to replace the Oracle ESB in favor of the Aqua Logic Service Bus (AL-SB). Maybe enhanced with some nice features of Oracle ESB. But the SOA Product Offering talks about a "Unified ESB" combining both AL-SB and OESB. Would that then be the Honda Hibrid of the Soa Suite? Because our customers that are using Oracle ESB for the past about two years have their Oracle ESB jDeveloper projects. And these probably are not deployable to the AL-SB (AquaLogic Service Bus) or visa versa. We're propagating Oracle ESB for I think two and a half years now. And of course our customers are listening properly to us, so they're using Oracle ESB massively. I know for example of a customer that is only using the ESB part of the SOA Suite as a successor of InterConnect. Though it may not be as large as the customer-base of AL-SB (I actually don't know about the ration in marketshares), we don't want to throw that away, don't we? Maybe this converged ESB is also having two engines (like the converged BPM-engines) or at least built in a way that it would support both the jDeveloper ESB projects as well as the AquaLogic Workshop ESB projects. In that case it would more be a car with a 3th generation LPG-installation: one engine that can be fuelled with regular lead-free gas (as in benzin) as well as LPG (Liquified Petroleum Gas also known as liquid propane gas). A project-colleague pointed me to an article of Bruce Silver on the diffference between BPEL and BPMN/XPDL. He also pointed me to this more academic comparison (pdf).